“The fruit company,” as Wei calls Apple, is just one of the rivals jockeying in the crowded Chinese smartphone market. As part of Chief Executive Officer Yang Yuanqing’s “PC+” plan to ensure that Lenovo remains relevant as consumers move away from computers, Liu ditched the one-size-fits-all LePhone strategy and built a portfolio of 19 smartphones, ranging in price from $130 to $385. That strategy helped Lenovo leapfrog Apple in 2012 and move into the No. 2 position behind Samsung. Its mobile Internet business accounted for 8 percent of total revenue in the third quarter of 2012, up from 3.6 percent a year earlier, and mobile revenue was 18 percent of China sales. China became the world’s largest smartphone market in 2012. Domestic shipments increased 180 percent last year, to 186 million handsets, according to Kevin Wang, director of China research at IHS iSuppli; shipments in China are expected to reach 268 million this year and 377 million by 2016. The bulk of those phones will be Chinese brands such as Lenovo, Coolpad, TCL, and ZTE. The quality of Chinese-made phones is improving quickly, says Warren Lau, an analyst in Hong Kong with Kim Eng Securities. “If you look at the pace of this upgrade cycle in China, it’s pretty impressive,” he says. Lenovo and other Chinese companies are becoming smartphone powers with help from chip designers. Building smartphones is far more complicated than making basic phones, and until recently required significant investment in R&D to create a design, integrate the components, and test the final product. San Diego-based Qualcomm (QCOM) and its two Asian rivals—Taiwan’s MediaTek and Shanghai-based Spreadtrum Communications (SPRD)—now take most of the guesswork out of smartphone design by selling nearly complete systems, including chipsets, other components, and software. The semiconductor designers “do all the heavy lifting, and magically it’s a package,” says Wong Teck Zhung, an analyst in Singapore with IDC. The plug-and-play model doesn’t work for more expensive, feature-rich phones. There, Apple and Samsung still dominate. On Dec. 17, three days after it started selling the iPhone 5 in China, Apple announced it had sold more than 2 million of them. But with Lenovo and other Chinese brands selling more low-end handsets, Apple’s share of the smartphone market fell from 10 percent in 2011 to 7.9 percent last year, according to IHS iSuppli. Samsung’s share fell from 20 percent to 14.2 percent, while Lenovo’s jumped from 5 percent to 10.4 percent. “The Chinese vendors are … like a pack of wolves snapping at Samsung and Apple’s heels,” says IDC’s Wong. With about 100 Chinese companies now selling smartphones in China, it’s difficult to stand out. That’s one reason Lenovo worked with Intel (INTC) to launch the K800, the first phone in the Chinese market to run on Intel’s newest Atom chip, which Liu and Intel CEO Paul Otellini unveiled at the Consumer Electronics Show in Las Vegas last year. 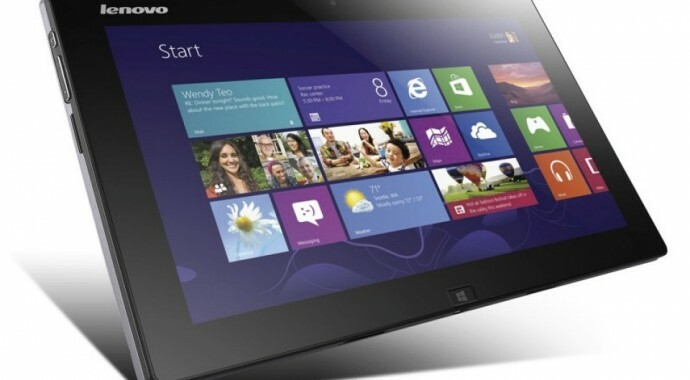 Lenovo plans to announce five new models at this year’s show, which begins on Jan. 8. With competition increasing at home, Lenovo has started selling smartphones in India, Russia, and Indonesia, and plans to move into Latin America and the Middle East this year. (Shenzhen-based rivals Huawei, ZTE, and China Wireless Technologies—which sells $100-to-$200 smartphones under the Coolpad brand—have been even more ambitious, teaming up last year with Richardson (Tex. )-based carrier MetroPCS Communications (PCS) to sell inexpensive LTE handsets in the U.S.) Still, Lenovo’s mobile division is not yet generating profits. Lenovo’s reliance on Chinese cellular operators for a big chunk of its smartphone sales means the company must share revenue with the carriers. Selling its own phones in stores would improve margins significantly. Another wild card is Lenovo’s partnership with Google (GOOG). The company is heavily reliant on Google’s Android OS. Following Google’s purchase of Motorola Mobility, the U.S. company is selling handsets that compete directly with Lenovo. “We have a very good relationship with Google,” says Liu. But, he adds, “it’s not a smart choice for Google to do the hardware. I don’t think it’s their strength.” Liu says Lenovo is talking with Microsoft (MSFT) about using the Windows operating system in some of its new smartphones. History isn’t on Lenovo’s side. Chinese cell-phone makers have come on strong in the past but have lacked staying power. In the early 2000s, a company called Ningbo Bird was the leading Chinese phone manufacturer and positioned to challenge foreign brands, but quickly faded. More recently, a handful of Chinese phonemakers were churning out inexpensive 2G knockoffs but lost business when consumers shifted to 3G networks and smartphones. The same thing could happen to Lenovo and other Chinese brands when consumers shift to the next generation of mobile phones that run on LTE networks. The bottom line: Lenovo and its rivals will ship nearly 270 million smartphones this year in China, which has become the world’s largest market.